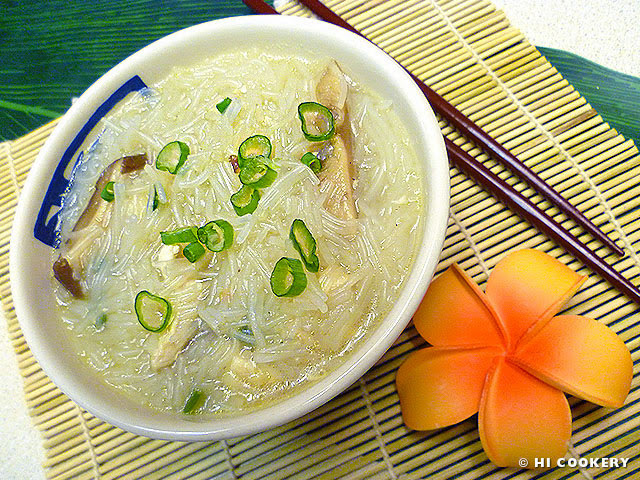 Whether found at the fanciest luau or in a humble Hawaiian home, chicken long rice is the islands’ comfort food equivalent of chicken noodle soup. Ironically, the “rice” in this dish is actually bean thread (also known as cellophane noodles for their transparency). 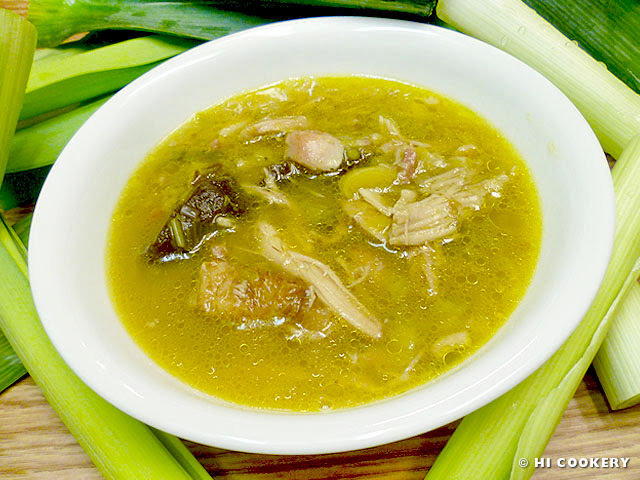 The taste is similar to tinolang manok without the noodles. 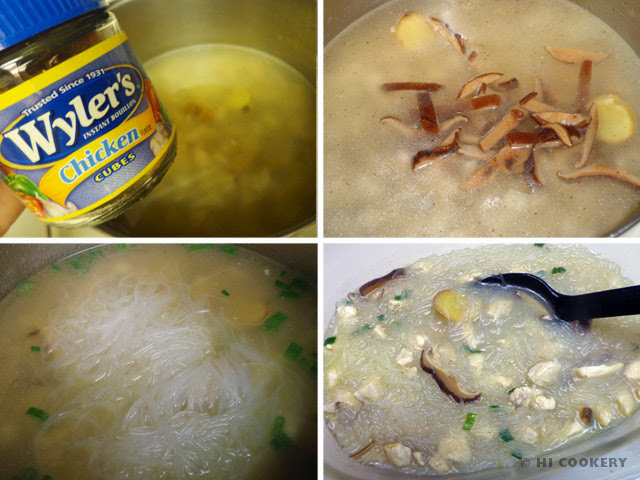 The hot gingery broth helps relieve congestion, the chicken provides protein and mushrooms are full of vitamins, making this textured noodle soup a healthy option. 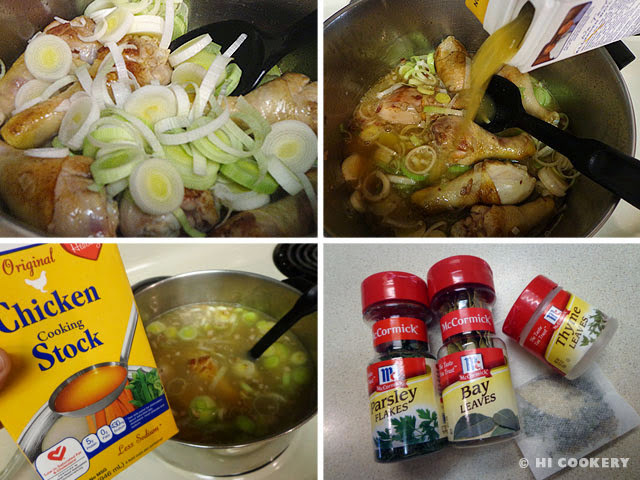 For National Chicken Noodle Soup Day, try a dish with a tropical twist and make some chicken long rice. Aloha! In a large dish, pour boiling water to cover the long rice. Soak until soft, at least 30 minutes. Cut into shorter pieces. Drain before using. 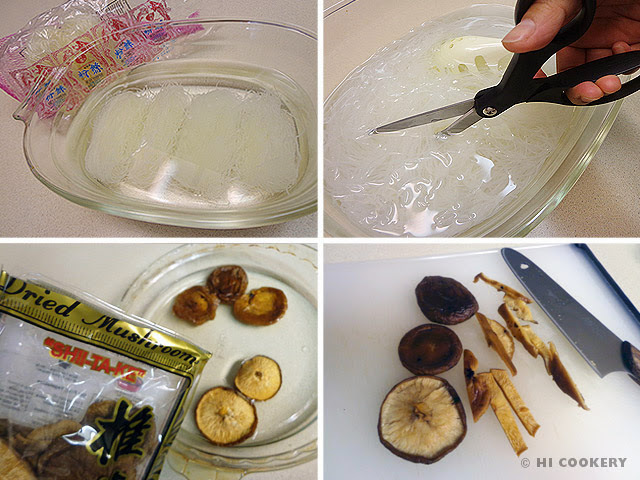 In a shallow dish, pour boiling water to cover the dried shiitake mushrooms. 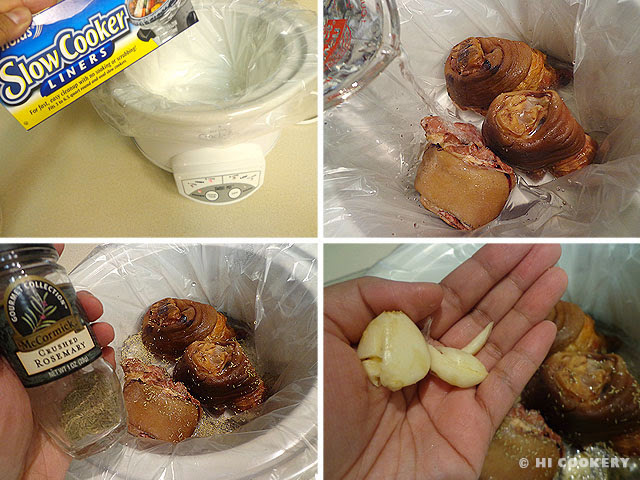 Soak until soft, at least 30 minutes. Remove from the water, squeeze out excess liquid and slice the mushrooms. Set aside. 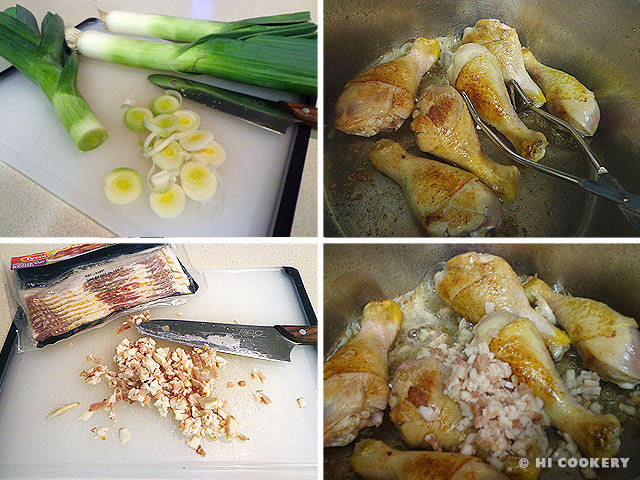 While the noodles and mushrooms are being hydrated, chop the chicken and ginger. Heat the oil on medium high and sauté the garlic cloves. Add the chicken and cook until lightly browned. Pour the water to cover the chicken and bring to a boil. Season with salt and pepper. 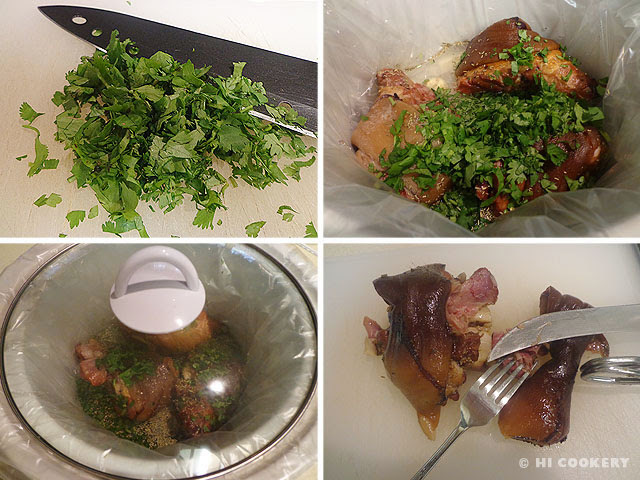 Lower the heat, add the bouillon cubes and ginger, cover and simmer for 30 minutes to let the flavors develop. Add the mushrooms. Gently stir in the noodles and cook on medium heat for another 10 minutes. 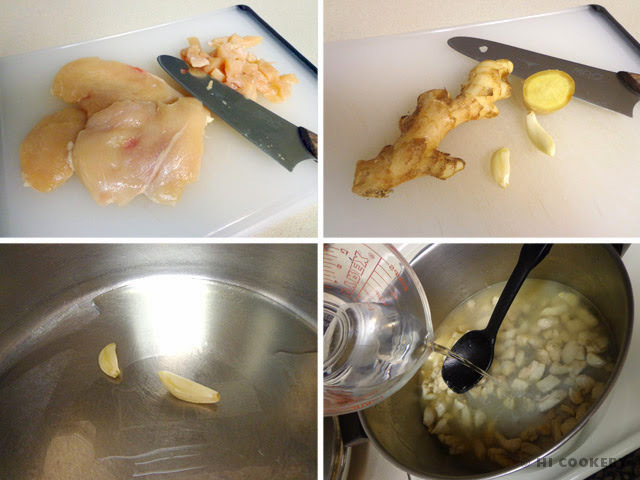 Discard the ginger and garlic. Ladle into soup bowls. Garnish with chopped green onions. Serve hot with chopsticks and a soup spoon. 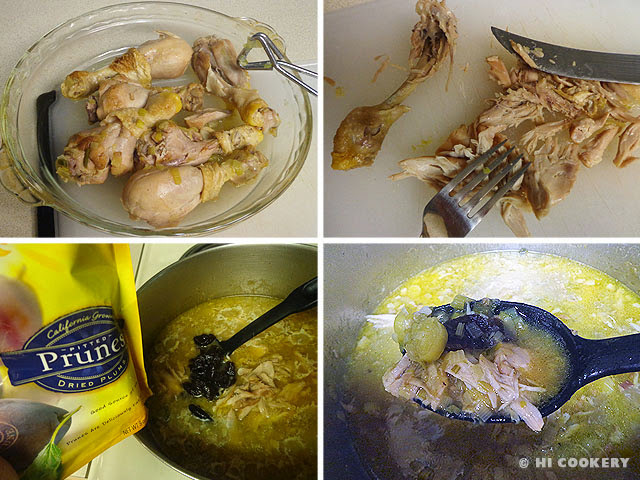 Season the broth with a tablespoon of soy sauce, oyster sauce or hot sauce (optional). At one of Highlander’s work conference dinners, we met a fellow foodie, Sol S., who aspires to write a comfort food cookbook. 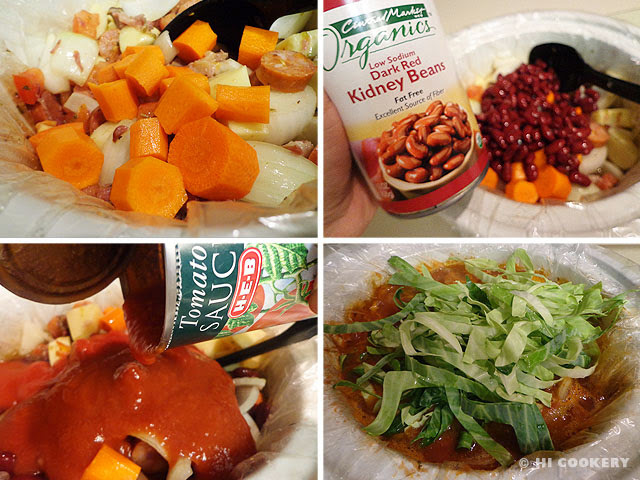 He wants to feature recipes that are homemade, healthy and hearty. 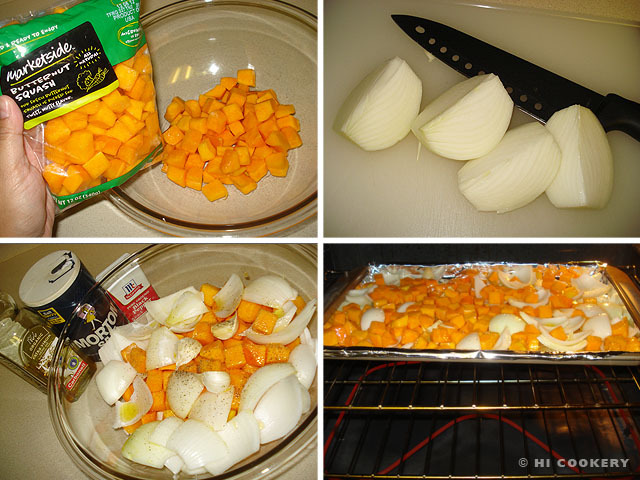 He shared with us his butternut squash soup recipe to try out in our own kitchen. It was delicious and simply satisfying! 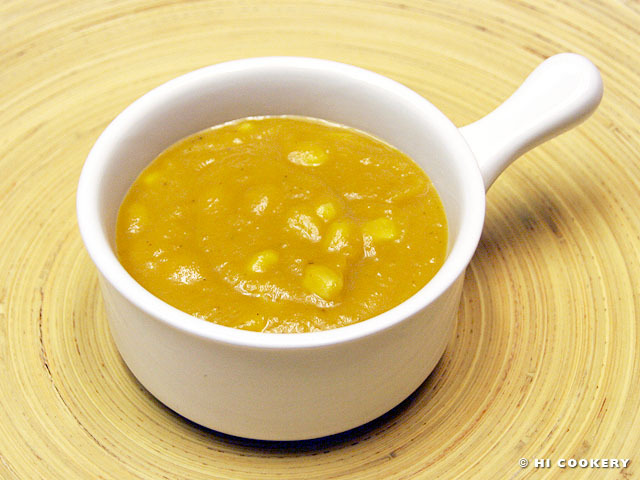 Butternut squash soup is comfort food for cold weather and is also appropriate for National Homemade Soup Day. Peel the butternut squash, cut the ends off, remove the seeds and dice into 1-inch cubes. Peel and quarter the onion, removing the ends. In a large bowl, mix the squash, onions and garlic with the olive oil, salt and pepper until well coated. Place on a foil-lined baking pan. Bake in a preheated oven at 375 degrees F for 45 minutes (after 30 minutes, stir to roast evenly). Remove from the oven and discard the garlic skins. In a large pot, place the roasted vegetables (squash, onions and garlic) and cover with the chicken stock. Simmer for 20 minutes. Let cool. Transfer the mixture to a large bowl. In a blender, puree in batches. 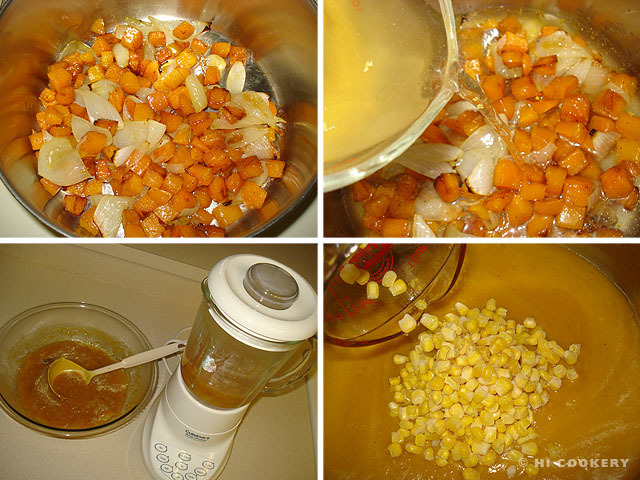 Put the pureed vegetables back in the pot and simmer with the sweet corn until heated through. Serve immediately in soup bowls. Sol S. garnishes his butternut squash soup with cooked shrimp or crabmeat or shredded chicken. The sweet corn adds texture to this recipe. Good luck to him as he authors his project! A Russian friend of a friend came to our house blessing in Illinois and was kind enough to share a cultural dish for our special occasion. 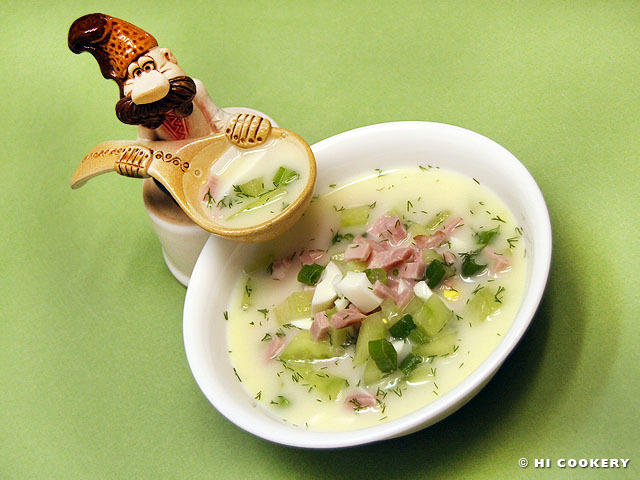 Kristina Y., whom we met through our Ukrainian friend Olga W., made a refreshing cold cucumber soup called okroshka. They explained that it is eaten during the short summer months in Russia and Ukraine. Although it is still winter in the northern hemisphere, and hot homemade soups are on most menus, okroshka may still be enjoyed where the weather is warm (such as in the southern hemisphere). For a refreshing Russian soup, try okroshka for National Homemade Soup Day. 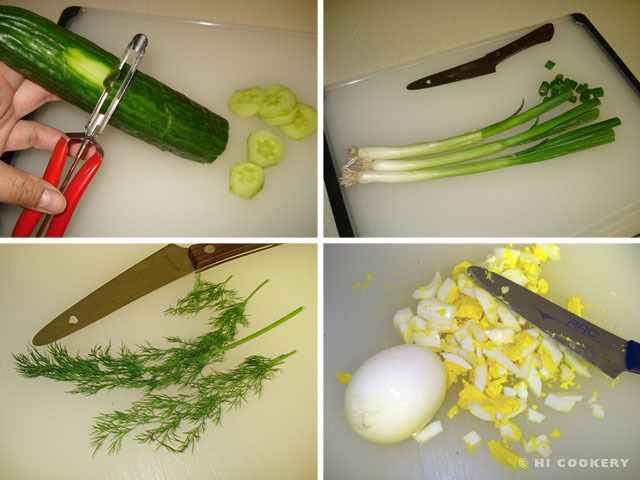 Chop the cucumber, slice the green onions, mince the dill and chop the eggs. Place everything in a large bowl. Pour in the water. Mix in the sour cream. 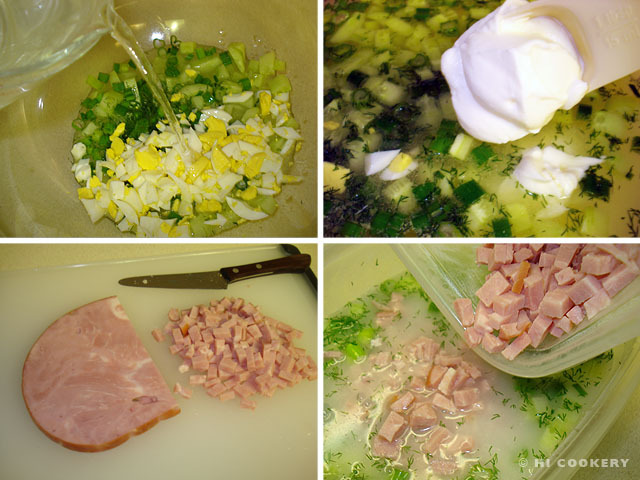 Chop the ham and add it to the soup. Season with salt. Chill in the refrigerator to allow the flavors to blend. Ladle into soup bowls. Garnish with additional dill (optional). Serve cold. 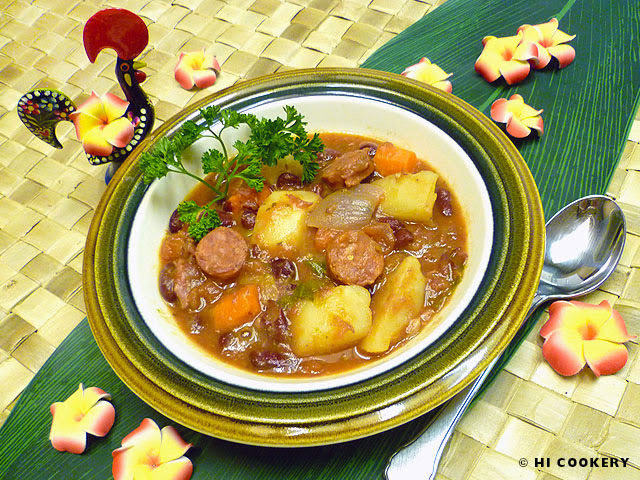 This soup is traditionally made with kvass (a fermented beverage made from rye bread). However, it is difficult to find kvass here so it is fine to use water as the liquid in the soup. Kvass adds a unique flavor to the soup. 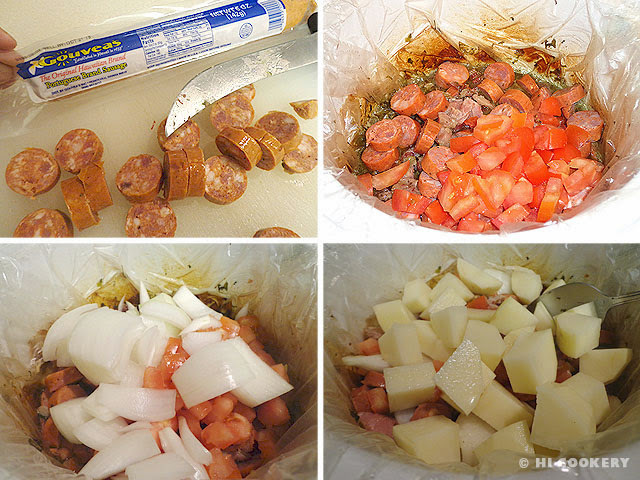 Instead of ham, sausages or other flavorful cooked meats, such as lamb, beef or chicken, may be used in this recipe. Sometimes ice cubes are added to the recipe to ensure a very chilled soup. Thanks to Olga W. for the ceramic figurine from Ukraine which we used in the final food photo above. January is also National Soup Month.